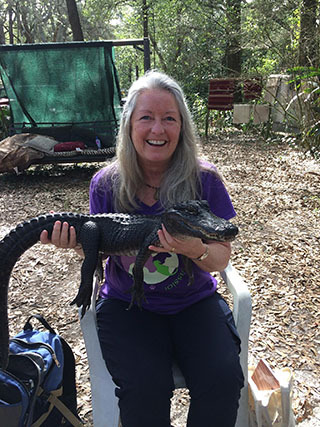 Every February SARA president Kathleen Prasad teaches Reiki III and Animal Reiki Training at the CARE Foundation in Apopka, FL. I enjoy seeing all the pictures from the classes and especially reading about the experiences the students share with the animals. The CARE Foundation, founded in 1996 by Christin Burford, is a non-profit, 501(c)3, Exotic Animal Rescue and Wildlife Education Facility providing permanent homes to over 200 animals. According to The CARE Foundation, they were established to (a) provide non-domestic, non-releasable animals with a safe and permanent home, and (b) to educate the public on conservation and current environmental issues concerning endangered and threatened species, as well as local wildlife and their habitat. I have been fortunate to be able to re-sit my training with Kathleen at CARE and to attend some meditation days. I was able to spend World Animal Reiki Day there this year and in 2016, visiting the animals and offering Reiki to so many species I don’t encounter at Rutland County Humane Society. Working with such a variety of animals opens me up to a deeper sense of wonder and curiosity and allows for unparalleled Reiki experiences. Of all the animals I sat with over my time at CARE, most surprising were the connections I made with several of the reptiles there. Admittedly, I never considered what it might be like to connect with a crocodile or a snake. It was a step out of my comfort zone, to be honest, and, thinking about it now, fear-based. Stillness–A very moving experience occurred during my first time at CARE. I was re-sitting Reiki III with my friend and fellow SARA teacher Jeanne Clune. It was time to practice Reiju and we wandered off to an enclosure tucked away down a path. There we encountered Ingozi, a Nile crocodile. Nile crocodiles are very aggressive and dangerous and I cannot even tell you why we chose to work by him. I am so glad we did! Jeanne and I greeted Ingozi and set up a chair for Reiju. The whole time he was right at the fence, yet never moving. He was awake and I had a clear sense that he was fully aware of everything happening around him though he didn’t shift or turn at all. When it was my turn to offer Reiju to Jeanne, I did so and as I stood in gratitude after, a powerful sense of stillness washed over me, something I had never felt to this degree. I understood right away that this was coming from Ingozi. I go back to that feeling of stillness whenever I need inner peace or grounding. I love revisiting Ingozi’s energy to prepare for meditation. Presence–One year, when attending the meditation day, I was rushing to get to CARE and feeling a bit frazzled from running late. I was one of the last to take a seat in the circle. Most of the people around the circle were already holding residents of CARE. 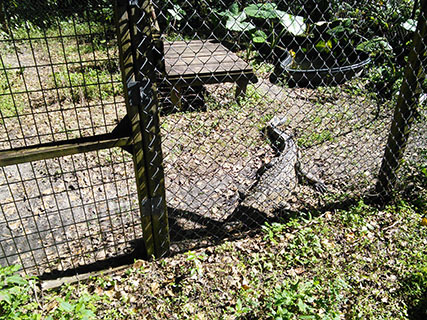 There were snakes, blue tongued skinks, exotic birds, and more. Christin Burford, CARE’s founder, asked who needed an animal. My hand went up and the next thing I knew, Christin plunked Brutus in my hands, gave me advice on how to hold him, and walked away. Brutus is a small American alligator, so I wouldn’t be lying when I said everything stopped! I was completely present! I was solidly in my chair and fully aware of the creature in my hands and nothing else. Then my mind raced–Would he bite me? Am I holding him too tightly/too loose? Can I hang on to him if he suddenly moved? As it turned out, someone moved behind me and Brutus reacted, but I was able to hold him. I took a deep breath and began to relax. Do not worry, fear is distraction! I focused on that feeling of being completely present so I could be with Brutus, free of fear and with compassion. Courage— Another day, we had the opportunity for pictures with many of the animals at CARE. I loved holding Boo, the lavender skunk and Yoda, the kinkajou. I watched other people holding the snakes, admiring their courage. I could feel the desire to push past my fear, but I kept putting it off. Many years ago I watched this beautiful little Balinese girl with a snake wrapped around her–completely fearless. I remembered I was willing to reach out and tentatively touch the snake but when asked if I wanted to hold it, I demurred. Later, when I would see the picture of that little girl, I would chastise myself for being afraid. I mean, I like a good adrenalin rush! What happened? But, listening to my Reiki friends talk about the power of the snake’s energy, I knew I just had to step out of my comfort zone and experience it for myself. 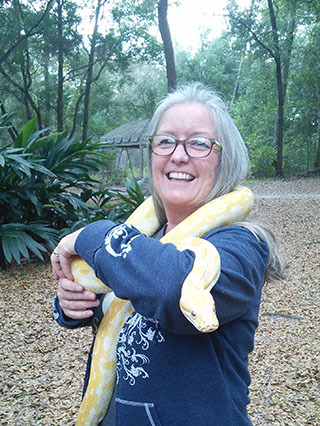 The next thing I knew, I had Blonde, the resident Albino Burmese Python around my shoulders like a stole. She was beautiful and I was enthralled! What an incredibly empowering experience! This was a potent reminder that on the other side of fear lies love. Our precepts tell us, “Do not worry, fear is distraction.” When I move away from fear I am willing to open my heart. When I can see the scariest creature with compassion I am being Reiki. Blonde, by being completely in her nature of snake energy taught me how to face my fear of the unknown. This is a lesson I can apply everywhere. These three valuable lessons are ingrained in me now. I am always connected to these incredible creatures and feel deeply grateful for their lessons. Thank you Ignozi! Thank you Brutus! Thank you Blonde! Subscribe now, and receive weekly newsletters listing new events and interesting charity activities. Designed with Love by Hatchbytes. Join hands with us for a better life and more beautiful future.